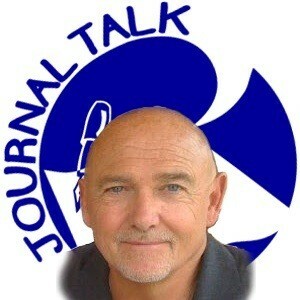 Returning to JournalTalk is Dr. John Evans, founder of Wellness and Writing Connections. Back in Episode #15, Dr. Evans shared about his connection to the rewriting of the landmark research compendium, Writing To Heal, by Dr. James Pennebaker. In this episode, Dr. Evans shares an update on that work (including its new title, Expressive Writing For Health) as well as some heart-stirring examples of the kind of work that he does. Don’t miss this: Dr. Evans reads some writings from one workshop participant (shared with the author’s permission, of course). Very moving! This entry was posted in Audio Podcast, JournalTalk and tagged James Pennebaker, John Evans, journal-writing podcast, research, Wellness and Writing Connections, Writing To Heal on February 6, 2014 by Nathan Ohren. Who knew, back in Episode #4 when I discovered the amazing-but-unavailable book, Writing To Heal, that I’d eventually be interviewing the co-author of its revised and updated edition?!! I learned a lot from my guest this week, John F. Evans, MAT, MA , Ed.D., a consultant, writing clinician, and an integrative health coach who speaks at national and international conferences about the power of writing to create better health, overcome trauma, and build resilience. He is also the founder and executive director of Wellness & Writing Connections, providing individual, group, and institutional life course guidance programs. The first thing I learned from John is that I still have much more to learn about being an effective journaling coach! With an astute-yet-modest perspective, John shares some of the scientifically proven health benefits of expressive writing (while cautioning me of the potential dangers of simply touting them to others)! We also discuss the Pennebaker Paradigm, and the contribution that John is making to update and re-publish the landmark guidebook in this field, Writing To Heal, by Dr. James Pennebaker. As mentioned in Episode #4, this groundbreaking and revered work has been out-of-print for several years. This entry was posted in Audio Podcast, JournalTalk and tagged audio, benefits, expressive, health, John Evans, journaltalk, Pennebaker, podcast, Writing To Heal on September 15, 2013 by Nathan Ohren.